Ismae has always believed that she’s a curse after knowing that she was sired by the God of Death himself. She lived a life of misery and hatred, but all that changed when she was given a chance to stay at the convent that serves St. Mortain, the God of death. This book was absolutely gorgeous and brilliant! Just… WOW! I was completely hooked once I started reading this! R.L LaFevers did a great job building Ismae’s historical, fantasy world. Everything seemed believable and real, and I felt that I’m also there myself, watching the characters come to life. I love the characters, even the minor ones. I can’t help but sympathize with them, especially the young duchess, Anne. At the young age of twelve, she carried the responsibility of protecting Brittany from the clutches of France. Ismae is a strong heroine and I adore her for listening to her own heart for following the path she must choose. She’s an awesome assassin and her gadgets are so cool! I want her bracelet! The way Ismae and Duval’s relationship grew was also sweet. I love how their understanding with each other grew and they really make a good team. The plot was fast-paced and thrilling that it had me to the edge of my seat. There were deceptions, assassinations, political conflicts and of course, romance. The story is unique and refreshing. I enjoyed every bit of it! R.L. LaFevers presented the readers with an exhilarating plot with a really strong voice. The characters are unique and likeable in their own way, and the world she built completely sucked me out of reality. 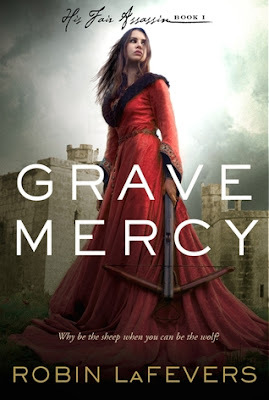 Those who enjoy reading novels with strong heroines, historical settings, awesome assassins and gorgeous dukes and knights will definitely enjoy Grave Mercy. That is one gorgeous cover! And the story sounds so interesting! Definatley will be picking this up when it comes out! A classic read, I was immediately sucked into this one. Written as if one were living in the 12th century, Ms. LaFevers did a fantastic job of recreating the old language and dialogue of ancient times. It isn't like reading a story someone wrote about the 12th century, it's like hearing a story from someone while you're in the 12th century. I loved it. The dialogue was unbelievable and the plot kept me guessing till the very end. Filled with intrique, mystery and thrills, this title is definitely going to be huge. I can see a movie here folks. Yes, it was that good.